Pick you up from airport and transfer to hotel. Today, visit the majestic Badaling Great Wall, Dingling Tomb of Ming Tombs, tomb cluster of Ming Dynasty emperors, and the colorful Cloisonne Factory. 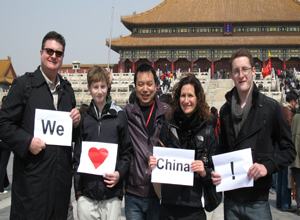 The morning tours are arranged in Tiananmen Square, and Forbidden City ; afternoon tours in Temple of Heaven, and Tea House; in addition to the Chinese Kung Fu Night Show. Today we do the sightseeing in the beautiful royal garden-Summer Palace, the Panda Hall in Beijing Zoo, the Silk Factory, Olympic Green (an exterior visit to Bird’s Nest and Water Cube). The highlight is the Hutong tour with rickshaw to feel old Beijinger’s life.